Honolulu Hawaii Yellow Cab Taxi Service Island wide 24 hours day. Providing the Best Taxi Cab and Airport transportation service in Honolulu, Hawaii. A reliable 24 hour, 7 days a week taxi service including Honolulu airport and Waikiki hotels. Offering the latest computerized GPS taxi dispatching for fast, secure, efficient door to door taxi service. Yellow Cab Honolulu proudly supports & services all military bases on Oahu. Special Flat rate taxi service for KBAY Marine Corps and Scholfield Army Base. The largest taxi fleet servicing the Honolulu Hawaii area! Yellow Cab, Trusted and recognized name of dependable Taxi service with Competitive rates, utilizing experienced, knowledgeable, English speaking drivers. 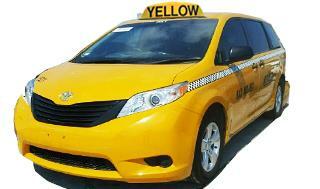 All of our taxis are late model air-conditioned vehicles. Ensure Yellow Cab with all your transportation needs in Honolulu. Honolulu Limousine Service, Whether you're visiting Honolulu for business or pleasure, you may schedule anything from a half-day, pre-set tour or a multi-day tour. They are fully customized to your individual needs. Our professional and knowledgeable chauffeurs will be your guide with advice on where to dine, where to shop, what to see and do. Honolulu Limousine and Sedan service offers VIP Service at bargain prices. Online limousine reservation service. Flat rate shuttle services available from Honolulu airport to Waikiki, koolina, North Shore, and all boat piers. This is a great savings on taxi service for large groups or large amounts of luggage. Yellow Cab Honolulu is asking for your help to stop drunk driving. We offer 24 hour cab service island wide in our commitment to help save lives and stop drunk driving. We are Hiring Taxi drivers become part of the team at Yellow Cab Honolulu. Looking for safe, reliable, English speaking taxi drivers in Honolulu with a clean driving record.